Almighty ever-living God, who adorn the sacred body of your Church with the confessions of holy Martyrs, grant, we pray, that, just as the glorious passion of Saint Ignatius of Antioch, which we celebrate today, brought him eternal splendor, so it may be for us unending protection. Through our Lord Jesus Christ, your Son, who lives and reigns with you in the unity of the Holy Spirit, one God, for ever and ever. According to the 1962 Missal of St. John XXIII the Extraordinary Form of the Roman Rite, today is the feast of memorial of St. Margaret Mary Alacoque. Her feast in the Ordinary Form of the Roman Rite is celebrated on October 16. St. Ignatius feast in the Extraordinary Form is on February 1. In the Martyrology we read: "At Rome, the holy bishop and martyr Ignatius. He was the second successor to the apostle Peter in the see of Antioch. In the persecution of Trajan he was condemned to the wild beasts and sent in chains to Rome. There, by the emperor's order, he was subjected to most cruel tortures in the presence of the Senate and then thrown to the lions. Torn to pieces by their teeth, he became a victim for Christ." The year of St. Ignatius' death is unknown; perhaps it occurred during the victory festivities in which the Emperor Trajan sacrificed the lives of 10,000 gladiators and 11,000 wild beasts for the amusement of the bloodthirsty populace. The scene of his glorious triumph and martyrdom was most likely the Colosseum; that mammoth structure, glittering with gold and marble, had then been just completed. "From Syria to Rome I must do battle with beasts on land and sea. For day and night I am chained to ten leopards, that is, the soldiers who guard me and grow more ferocious the better they are treated. Their mistreatment is good instruction for me, yet am I still far from justified. Oh, that I may meet the wild beasts now kept in readiness for me. I shall implore them to give me death promptly and to hasten my departure. I shall invite them to devour me so that they will not leave my body unharmed as already has happened to other witnesses. If they refuse to pounce upon me, I shall impel them to eat me. My little children, forgive me these words. Surely I know what is good for me. From things visible I no longer desire anything; I want to find Jesus. Fire and cross, wild beasts, broken bones, lacerated members, a body wholly crushed, and Satan's every torment, let them all overwhelm me, if only I reach Christ." The saint, now condemned to fight the wild beasts, burned with desire for martyrdom. On hearing the roar of the lions he cried out: "I am a kernel of wheat for Christ. I must be ground by the teeth of beasts to be found bread (of Christ) wholly pure". Patron: Church in eastern Mediterranean; Church in North Africa; throat diseases. Symbols: Chains; lions; bishop surrounded by lions; heart with IHC; crucifix; heart. 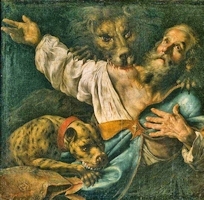 Read more about St. Ignatius of Antioch here. Bake wheat bread or make something with wheat kernels. Hot cross buns or pretzels in their traditional shape remind us of the cross which we must embrace, as St. Ignatius did.